Hi there! Thanks so much for stopping by today - I hope your Monday is off to a great start! Are you almost ready for Halloween? I can't believe that it's almost here. Seems like October just arrived! I think I'm almost done with all of my Halloween projects and really need to get a move on for Thanksgiving and Christmas! I've already given this to Emma because I know it will be crazy around her on Halloween night! 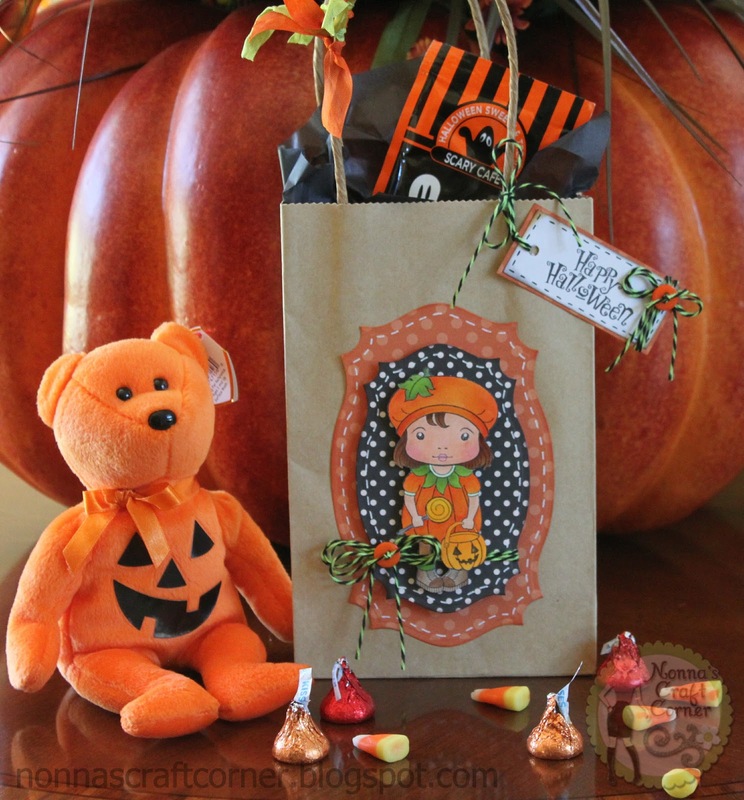 She loved all of her goodies and the sweet little pumpkin girl. 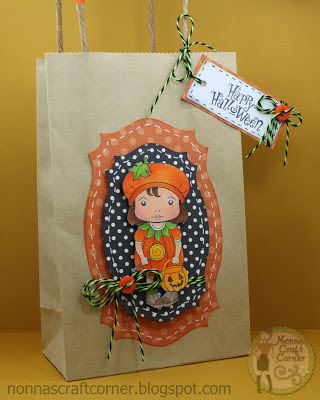 I am going to link my project up over at Paper Playtime for their "Anything Goes" challenge. Thanks again for stopping by today - I always enjoy your visits and look forward to your sweet comments. I'll be seeing you soon. The image is so adorable!!!OH1MY!GOODNESS!! Love your gift bag Tanya and can see why Emma did too!The image is lovely and you coloured her beautifully. How adorable is this!!!! LOVE the sweet image and your coloring is awesome!! TFS and have a GREAT night! How LUCKY is Emma?! Love, love, love her cute treat bag!!! :) And that Beanie Baby?!!!!!! As a former collector (live & learn! ), I still can't pass up the holiday ones and love decorating with them! Love your dotty papers. That image is adorable. You colored her beautifully. Tanya ~ ADORABLE!! I LOVE the image and how you colored her!! I don't think you need to practice ~ maybe practice teaching me but BEAUTIFULLY colored! 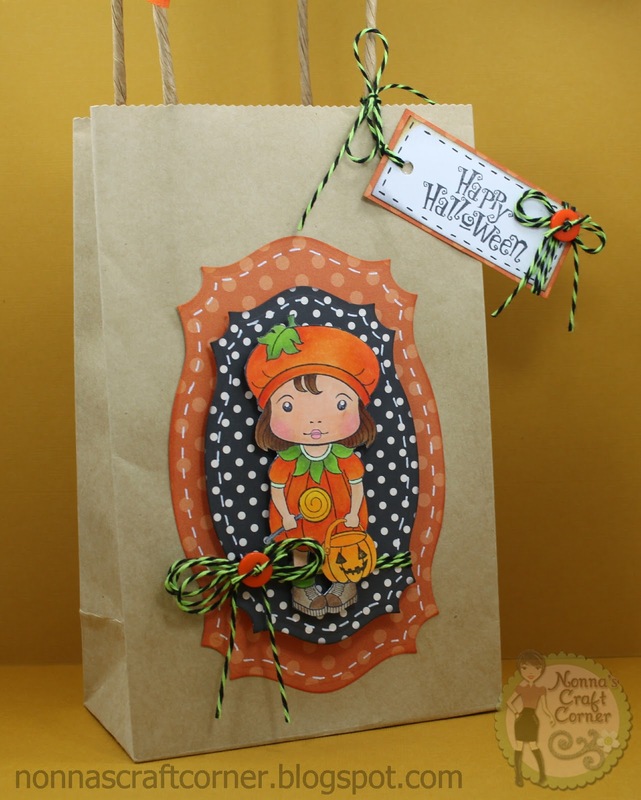 LOVE the papers and the spellbinders you used and how you wrapped the twine! Well I always say your little Miss Emma is one lucky litte girl! Look at all that candy ! YUM!! Happy Halloween!! This is adorable! You really did a great job on coloring that darling image. I'm sure your granddaughter really got a kick out of it! Oh I know Emma just loved this so much! It's gorgeous and it's colored so pretty!